The company Voctro Labs,S.L., with registered offices in C/ Pujades 74-80, 08005 - Barcelona (Spain), with Tax Identification Number B-65.699.662, registered in the Companies Registry of Barcelona, Volume 42942, Folio 161, Page number B 42023 (hereinafter referred to as “VOCTRO LABS”) is the owner of the web site http://www.voiceful.io (hereinafter referred to as “Web Site”). Address: C/ Pujades 74-80, 08005 – Barcelona (Spain). Any personal data you provide us under a registration online form on the Web Site, included but not limited to your CV or project in terms of our professional collaboration, as well as the information collected by virtue of the commercial relation and/or provision of services acquired through the Web Site, shall be incorporated into a file duly registered before the General Registry of the Spanish Data Protection Agency, under the responsibility of VOCTRO LABS, S.L., C/ Pujades 74-80, 08005 - Barcelona (Spain), with Tax Identification Number B-65.699.662 (hereinafter referred to as the “VOCTRO LABS”). The purpose of the data processing is the provision of the services offered by VOCTRO LABS on the Web Site, including the Customer Service, enquiry assistance and information requests, job applicants evaluating processes and projects as well as claim management. Send a written communication to VOCTRO LABS, S.L., C/ Pujades 74-80, 08005, Barcelona (Spain), attaching a photocopy of your ID or official document that certifies your identity. VOCTRO LABS uses Google Analytics cookies, whose settings are pre-determined by the service offered by the company Google, reason why we suggest you to consult the privacy page of Google Analytics, http://www.google.es/intl/es_ALL/analytics/learn/privacy.html to obtain more information on the cookies used and how to disable them (it being understood that we are not liable for the contents or veracity of the third-party web sites). *Clients also available for Python and Ruby. “El Plan B de Ballantine’s" Online Advertising Campaign by Pernod Ricard consisted in inviting the fans of a famous band (La Oreja de Van Gogh) to compose the lyrics for a new song using a mobile app, hear how their own lyrics would sound and share them with the band. In six months of campaign, more than 20.000 lyrics were received and the song created afterwards, using user lyrics, arrived soon to the Top 10 music charts. The campaign was awarded with the first prize in “El Sol” advertising and communication festival. Voctro Labs developed a female Synthetic Voice Model and an on-line web service to convert the user lyrics into synthesized singing by the female virtual voice, retaining the singing expression and naturality of the band's real singer. 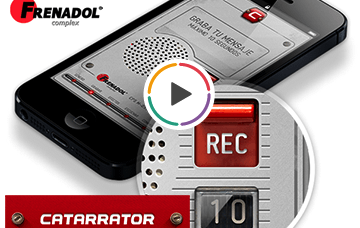 Frenadol Catarrator is an innovative and funny way of marketing that has been used for a product called Frenadol by Johnson Johnson, a company operating in pharmaceutical sector. The user can record an up to 15 seconds voice message, justifying his absence or apologising for failing to meet a commitment. Thanks to the app, the voice becomes congested by various cold symptoms (cough, hoarseness, sneezing) to make it sound realistic. The result is the perfect excuse to get rid of the most boring plans, even if the costumers are perfectly healthy after having used the product. Voctro Labs integrates a Voice Transformation technology that allows manipulating the voice of the user to generate cold disease effects. The app was launched in 2013 and is still available for iOS and Android. 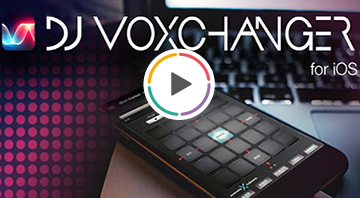 “DJ Voxchanger” offers tech lovers and music hobbyists the ability to separate and transform any vocal, in any song (mono or stereo), independently from original multi-track recordings. DJ Voxchanger's preset effects and familiar faders instantly transform any vocalist into a Robot, Monster, Alien, alter the age or gender of any vocalist, add harmonizer and tuner effects or even change the overall pitch of the vocal performance. This remix can be recorded in the real-time and shared by email, iTunes, Soundcloud, or other apps on your device such as Dropbox. Voctro Labs integrates proprietary Voice Transformation technology that allows transforming vocals in real-time and apply effects like gender change, pitch correction, harmonizer, robot, alien or monster. 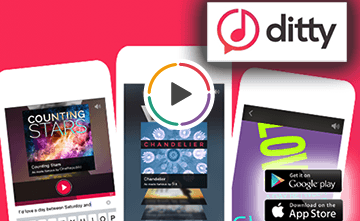 “Ditty” for Messenger Mobile app is a fast and fun new way to send friends a custom song and lyric video. It is as simple as write a short text, pick a song from the library containing classic songs and current hits and Ditty sings your message for you. Creations can also include a video to be shared instantly via Instagram, Facebook, Twitter, SMS, email and more. The app reached more than 1 millions downloads during the first month and became a top trending app during its launch days. The app won the 2015 Appy Award for Best Music App. Voctro Labs integrates Singing Voice Synthesis technology and develops custom voices for this mobile app. The app was launched in 2015. “Mursion" is a virtual reality company based in San Francisco, USA. The company develops and provides a virtual reality environment where professionals practice and master the complex interpersonal skills necessary to be effective in high-stress professions. 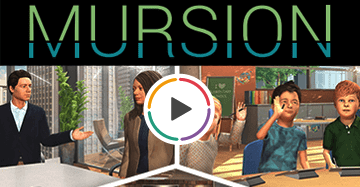 Used by a wide range of innovative organizations in healthcare, education, hospitality, finance, and other corporate sectors, Mursion delivers customized virtual reality simulations that recreate the most demanding interpersonal challenges that professionals confront on the job every day. Voctro Labs integrates voice transformation technology, where user voice is modified in real-time changing its timbre using a configurable preset. “Take 7" is a state-of-the-art music learning program that guarantees to improve your musicianship based on proven pedagogical methods. 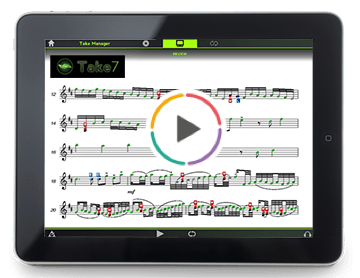 Take7 will record your performance through a computer microphone, analyse it and give you a score, suggest ways you can improve your playing, and guide you through exercises to help you accelerate your learning. You can select backing tracks to play along with and adjust the playback speed with the tempo slider to find a tempo that's comfortable for you without sacrificing audio quality. The performance can be reviewed anytime and even shared with friends. Voctro Labs integrates audio transformation technologies that allow to control tempo of the songs, speeding up or slowing down the music without degrading the audio quality. It has been adapted to be cross-platform and is available on all major computers and devices. to create new ways of expressing yourself. You write or customize the lyrics, and an incredibly expressive voice sings it for you. Commission us your own voice model, be it a famous or a beloved one, be it dead or alive. Sound like a robot. Sound like your son. Sound faster, or chilled. Do some voice lifting. Everyone is gifted with a hidden talent. Sound like you can sing and share it to the world. Or let’s talk. We’re a collaborative bunch. The content will be processed on our servers, no matter if uploaded by users or generated by Voiceful. It will be available on our storage until expiration date – but you can also extend Voiceful as a storage and distribution option with an extra fee. for voice interaction devices, personalized interactive products, internet of things and robotics. Voiceful is created by Voctro Labs, a team of audio experts passionate about innovation. With 15 years of applied research experience at MTG-UPF, we’ve licensed technology worldwide from our Barcelona-based offices. We have worked with creative companies, industrial businesses and start-ups to deliver innovation projects. Amongst all of us we have contributed to dozens of patents and research publications. And we’re ready for new adventures.